After updating an iPhone, maybe it’s stuck. Doesn’t happen much, but it can happen. When it does, it’s great if you’ve got a backup of your phone. And those traditional means of restarting, resetting, and restoring don’t work any more. Or at least they do, but they’ve moved. If you need to DFU or restore your device, starts by plugging the phone into a computer running iTunes. Then press and hold the power button down for 3 seconds and press the volume down button while you’re holding that power button. Hold both down for about 10 seconds and let go of the power button, holding the volume down button for 5 more seconds. This process is pretty specific and I’ve often had to do it 3-4 times to get it just right. If you see the Apple logo at boot, the device is just rebooting (and that’s usually all I’ve needed). But if you really need it to go into restore or DFU-mode, you’ll want to see the screen that says Plug Into iTunes. Once you see that, you are in restore mode. If you want to be in DFU mode, you’ll want it right in the middle, where the screen is black. 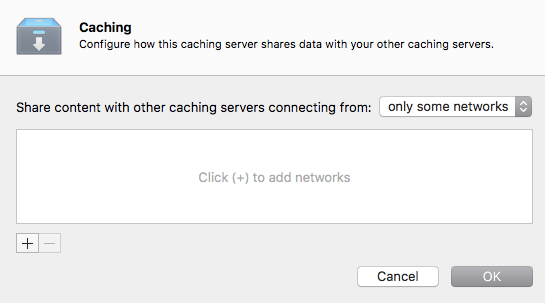 The Caching Server in OS X Server 5.2 (for Sierra) does content, apps, and software updates. The Software Update service is hidden by default indicating it will likely be removed from the Server app in a future update, although when is kinda’ up in the air. The Software Update service can still be enabled for now, which we’ll look at later. 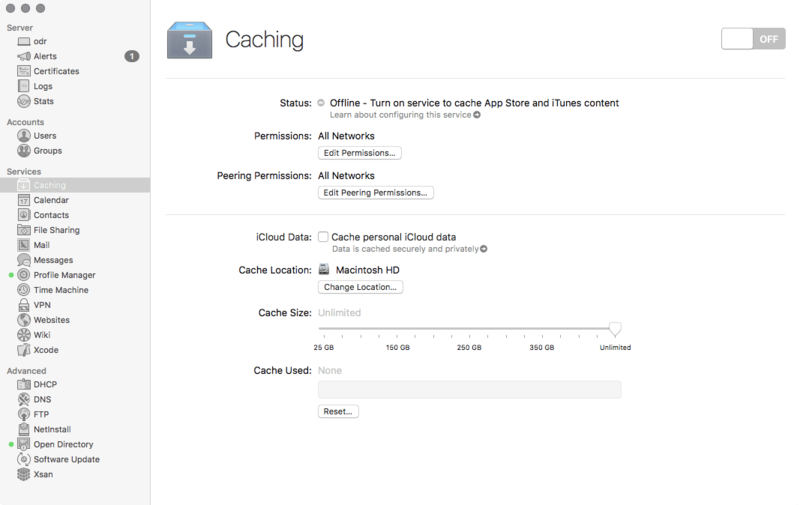 The Caching service on the Server app works like a proxy. When 10 of your users download that latest Nicholas Sparks book and movie, you only sacrifice your WAN pipe to download it once, and the other 9 people piggy-back off that. And when 10.12.1 ships, you only need to download it over the WAN once, and the other local users will pull off that spiffy Caching server sitting in your office. Pretty sweet, right? So, how do you use this ultra-complicated service? It looks and feels kinda’ like an iPad app. Which is to say that as far as server stuffs go, this thing is pretty darn easy to use. To get started, open the Server app and then click on the Caching service in the sidebar of the Server app. Here, click on the ON button. OMG, so hard. But wait, there’s more! Click on that Change Location button and you can select a larger volume for your updates that are cached. You’ll likely wanna’ do this because the entire series of the HBO drama OZ is kinda’ big (and yes, creepy, but really well written)… If you do change the location, you’ll see a window to change the volume you’re caching to. That’s pretty much it. Other than the waiting for the updates to move. 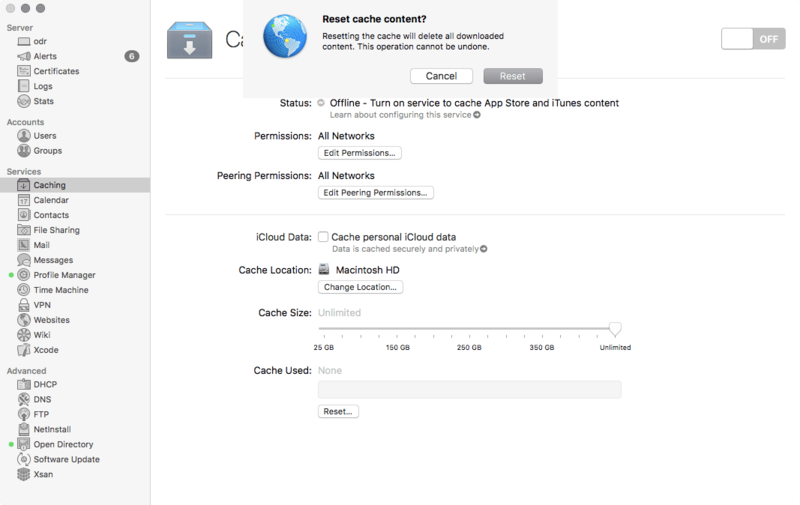 By default, the Caching service allows for unlimited space. Use the spiffy slider to reduce the total amount of space that the service can occupy on the hard drive. This can be a good thing if it happens to be your boot volume and there are other more mission critical services hosted on that thing. Overall, this all seems pretty straight forward. So what else might you need to know. In case you get a corrupt asset, or in case your volume fills up, there’s a Reset button, to reset the cache. The service can be controlled from the command line as well. To start it, use the serveradmin command along with the start verb and the service name (oddly, that’s caching). sudo /Applications/Server.app/Contents/ServerRoot/usr/sbin/serveradmin start caching To stop the service, use the stop verb along with the service name: sudo /Applications/Server.app/Contents/ServerRoot/usr/sbin/serveradmin stop caching To see a list of settings, use the settings verb with the service name: sudo /Applications/Server.app/Contents/ServerRoot/usr/sbin/serveradmin settings caching The settings are as follows, mostly available in the Server app: caching:ReservedVolumeSpace = 25000000000 caching:CacheLimit = 350000000000 caching:ServerRoot = "/Library/Server" caching:ServerGUID = "DEE63BBB-9F32-428B-B717-E3941F82E2DC" caching:DataPath = "/Library/Server/Caching/Data" caching:LocalSubnetsOnly = yes caching:Port = 0 One setting you might choose to change is the reserved volume space, as this can keep you from getting the service started on smaller volumes. In the above example, the setting is 250 gigs. 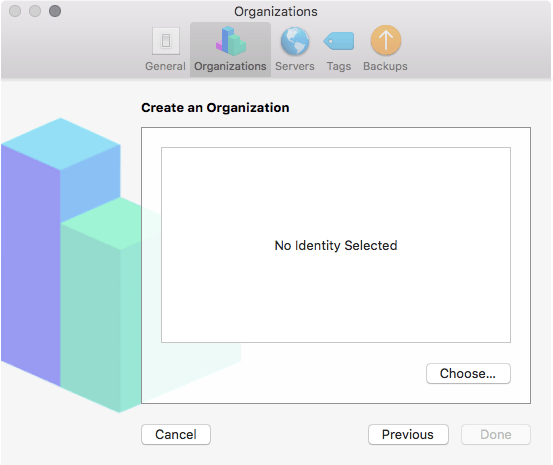 To change that to 100 gigs: sudo /Applications/Server.app/Contents/ServerRoot/usr/sbin/serveradmin settings caching:ReservedVolumeSpace = 10000000000 A new setting in Server 5.2 for macOS Sierra is defining other servers that can access your Caching server. This is like providing a proxy for a proxy. 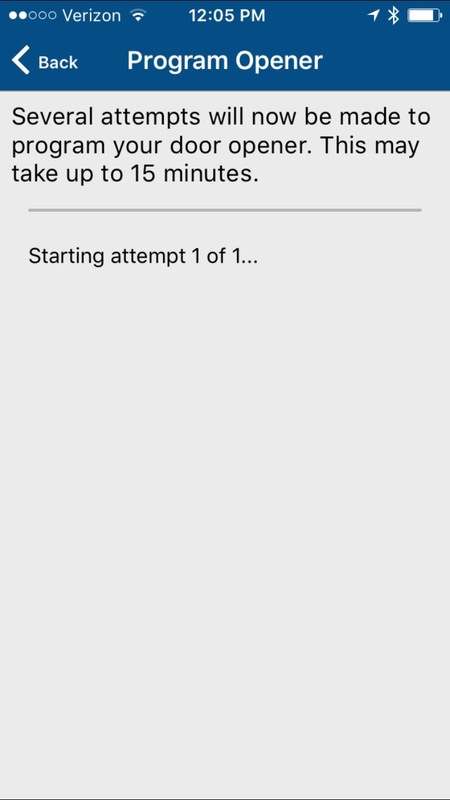 Basically if your devices can cache updates onto the server from other servers then the updates are caching much faster than if your server caches the updates from Apple. This is called Peering Permissions. To define Peering Permissions, click on the Edit Peering Permissions… button. At the Caching screen, click on Only Local Subnets if you want to let the server identify which subnets are local, or Only Some Networks to define which ranges of addresses have servers that can cache content and update from your server. 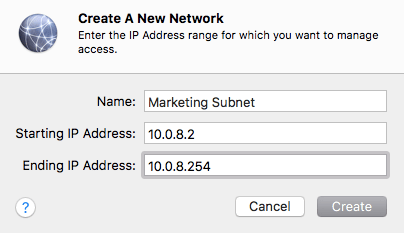 Click on the plus sign to add a network and then click on “Create a new network” At the Create A New Network screen, provide a name and then the first and last IP Click Create and then add all of the appropriate subnets. Click OK when you’re done. Restart the service and viola, you’re finished. 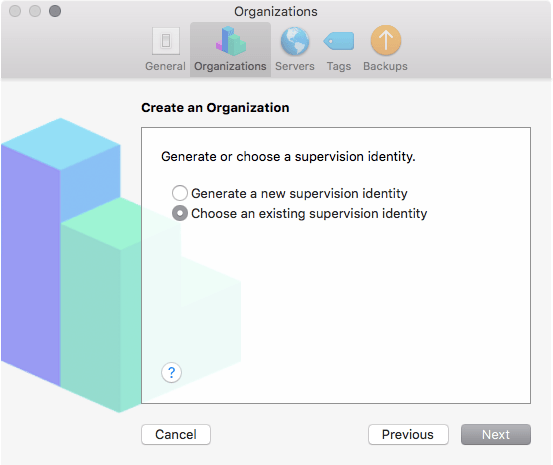 When using Apple Configurator, you can assign an existing supervision identity to be used with devices you place into supervision. 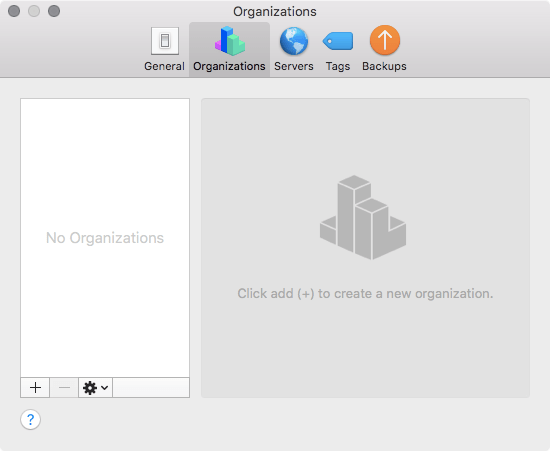 To do so, first open Apple Configurator and click on Organizations. From Organizations, click on the plus sign (“+”). From the Create an Organization screen, click Next. When prompted to provide information about your organization, provide the name, phone, email, and/or address of the organization. If you are importing an identity, select “Choose an existing supervision identity” and click on Next. When prompted, click Choose to select the identity to use (e.g. exported from another instance of Apple Configurator or from Profile Manager). 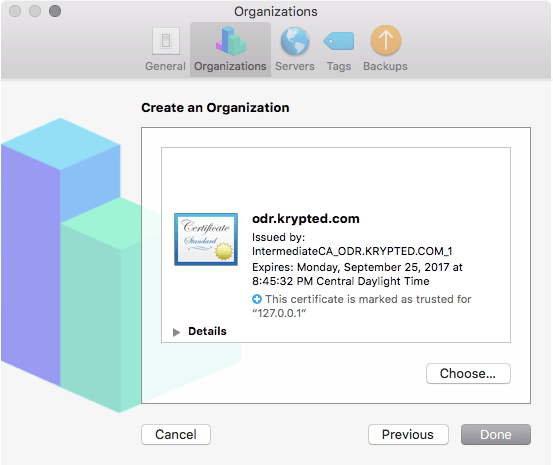 Click Choose when you’ve highlighted the appropriate certificate. Click Done. Looks like Sal et al posted a suite of Automator Actions to link the Casper Suite to Apple Configurator at https://configautomation.com/jamf-actions.html. In my limited tests so far they work pretty darn well! 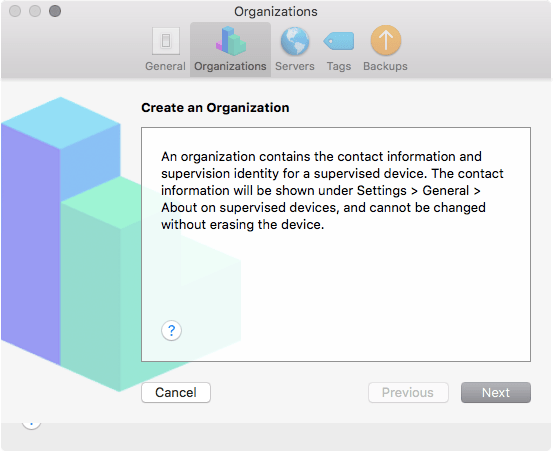 Some pretty cool things here, like having the JSS rename a mobile device when managed through Apple Configurator, having Apple Configurator instruct the JSS to remove a device from a group, clear passcodes, update inventory, and other common tasks involved in workflows when leveraging Apple Configurator for en masse device management. Good stuff! 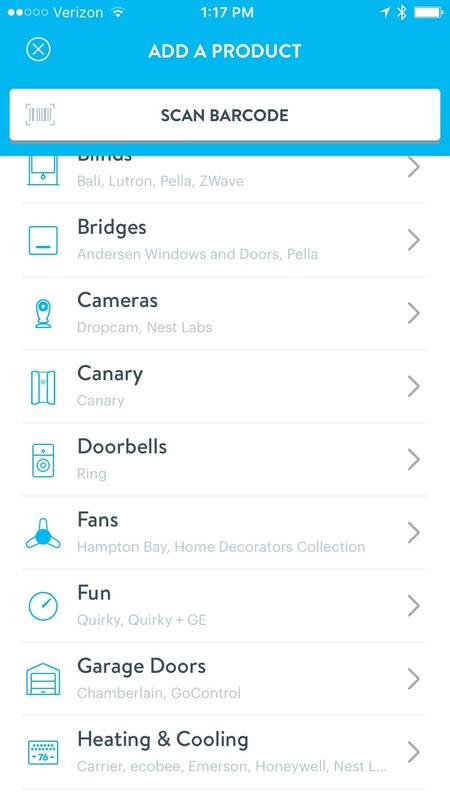 There are two main garage door openers in the home automation space. The first is the Chamberlain MyQ and the second is the GoControl. 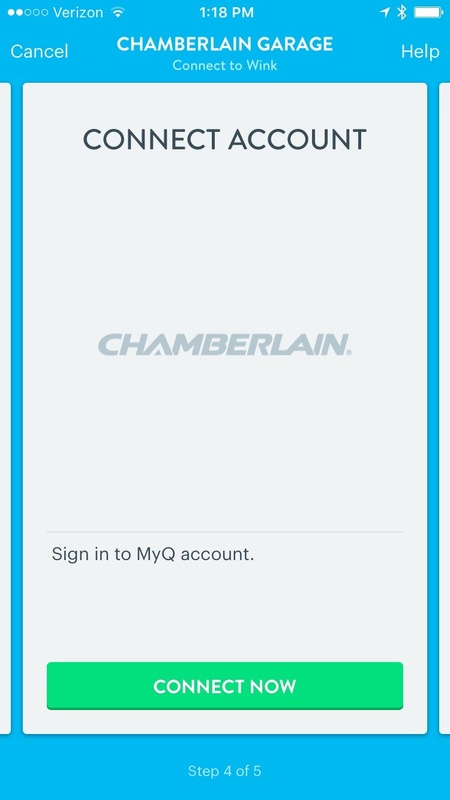 The hardest part about setting up the MyQ was that I had to hit a funny orange button on my existing non-automated Chamberlain opener and then hit the button on the opener in my car to sync ’em up. It took about 10 tries, but eventually it worked. Once configured, I didn’t love the loud noise the device made to open the garage door (guessing that because it’s compared with a strobe that this is a safety measure). Once the Chamberlain is configured, open the Wink app. Then tap Add A Product and then tap on Garage Doors. 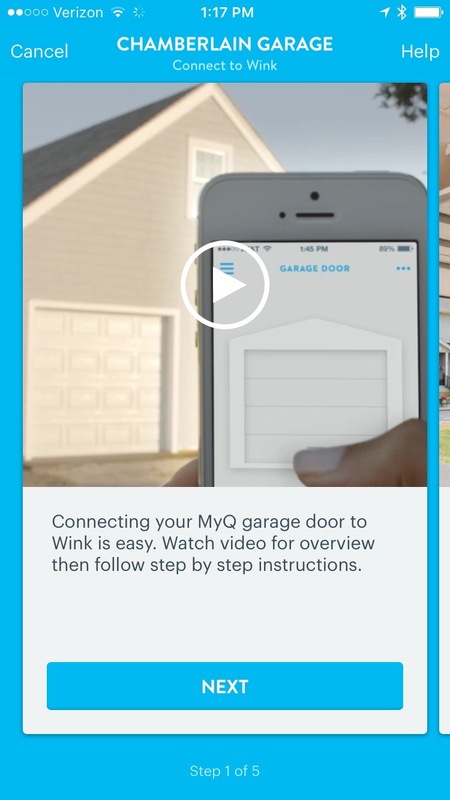 At the Garage Doors screen, tap MyQ Garage Door. 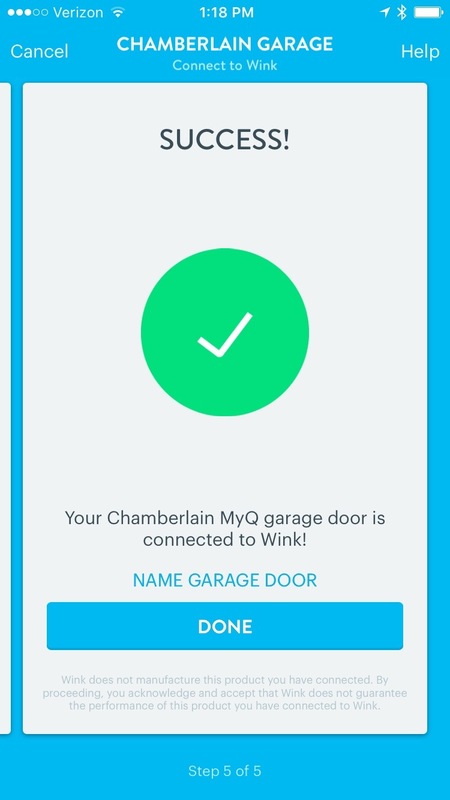 At the Chamberlain Garage screen, tap on Next to verify that you want to add a MyQ to the Wink. 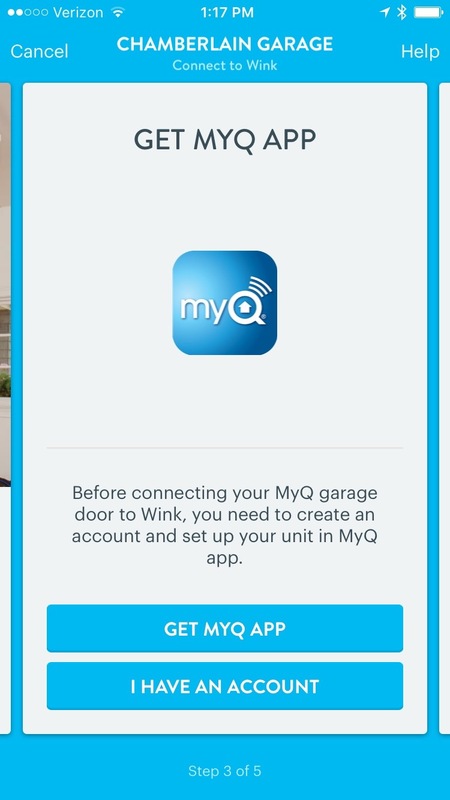 At the Get MyQ App screen, tap on I Have An Account (unless you don’t have an account yet, then tap on Get MyQ App and download the app, setup the garage door, and create an account). At the Connect Account screen, tap on the Connect Now button. 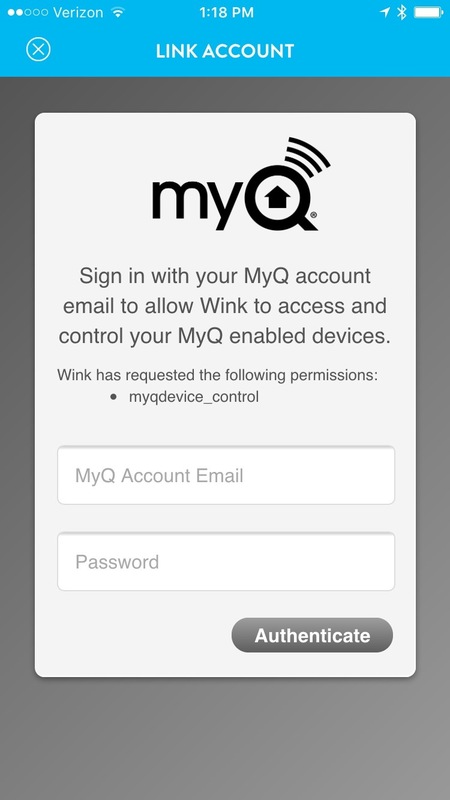 At the MyQ overlay of the Link Account screen, enter your credentials and then tap on Authenticate. Provided the authentication worked, tap on Done. 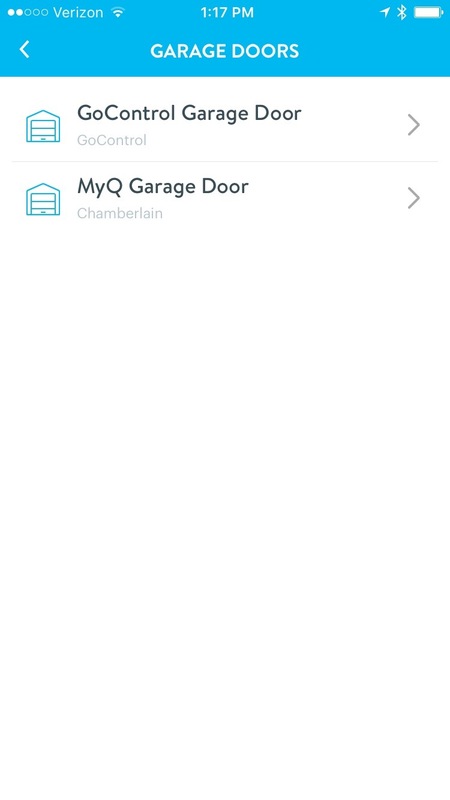 Tap Name Garage Door and provide a name for the door (useful if you have two doors). Next, use the Wink app to test the opener. The increase in the use and complexity of technological assets in the healthcare sector has been on the rise in the recent past. Healthcare practitioners have moved from recording data manually to keeping Electronic Health Records. This eases the accessibility and the availability of data to the health practitioners. Further, electronically stored data makes it possible for patients to receive high quality and error-free care, improve decision making process because medical history is available and also makes it possible to provide safer and more reliable information for medication. Despite, the numerous advantages that the use of technology in healthcare has, there is also a threat of patients data leakage that lingers around. According to a research by Garrison and Posey (2012), medical identity theft has far more consequences in comparison to the typical identity theft. In average, every medical theft case can cost $20,000, and represents a substantial privacy violation. For this reason and more, it is important for healthcare institutions to protect patient data by securing technological assets within the institution. This article will explore the different methods used to secure the technological assets, with an emphasis on mobile devices. The first method is limiting access to the electronic health records to only a few individuals. According to Gajanayake et al. (2014) suggests that there are different models of limiting access to the records. The first step is to ask for authentication, this will prompt them to verify their identity. This could be achieved by giving the authorized individuals unique passwords for identification and also by performing biometric scans of the individuals. This step will eliminate the possibility of unauthorized access to the technological access. The second step is to limit the type of information that one is supposed to access. This could be made possible using certain access models. Examples of models that have been proposed include Discretionary Access Control (DAC),Mandatory Access Control (MAC) and Role Based Access Control (RBAC). 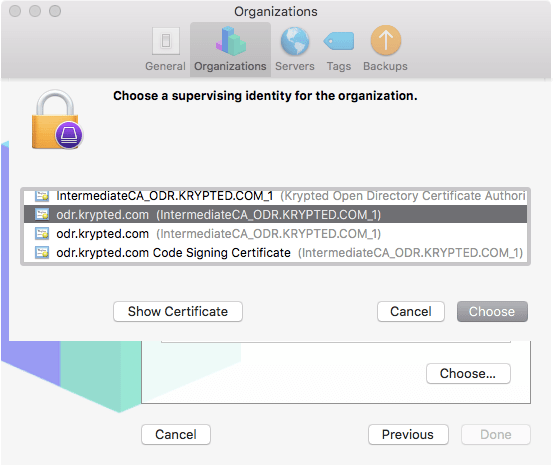 The DAC restricts access to certain commands such as’ write’, ‘read’ and ‘execute.MAC controls access by assigning information different levels of security levels. RBAC is based on the rights and permission that depend on the roles of an individual. These models normally apply to the security of electronic data. Other assets such as the hardware could be protected physically by limiting authorization to their storage rooms and also limit the location in which they are expected to be used at. Limiting access ensures that those that are not authorized to access the information are locked out of the database.Hence, this is an important strategy in protecting patients’ data. The second method is through carrying out regular audits on the electronic system and the individuals handling the technological assets. Audit controls record and examine the activities that involve access and use of the patients’ data. This can be integrated into the Electronic Health Record (EHR) system or used to monitor the physical movements of the individuals that have access to the records. In addition, HIPAA requires that all health institutions that use the EHR system should run audit trails and have the necessary documentation of the same (Hoofman & Podgurski,2007). Some of the information collected during audits includes the listing of the content, duration and the user. This can be recorded in form of audit logs which makes it easy to identify any inconsistencies in the system (Dekker &Etalle ,2007). Further, monitoring of the area where the hardware have been placed for used should be done. This can achieve by use of recorded video, which monitors the activities of individuals who use the system. This can also be audited regularly and any inconsistencies noted (Ozair et al., 2005) Carrying out audits of the technology assets of the healthcare institution will help to monitor the daily use of the system which will enable the identification of any abnormal activities that may endanger patients’ data. The third method is the setting up of policies and standards that safeguard the patients’ data. These policies may vary from one institution to another. For instance, the employees should be prohibited against sharing their passwords and ID and they should always log out their accounts after accessing the system. The authorized individuals would also be properly trained about these so that they are aware of their importance. In addition, these policies should be accompanied by consequences which will impact the users. This will ensure that they follow the policies to the letter. The set of policies and standards are to ensure uniformity in the protection of patients’ data (Ozair et al., 2005). The fourth method that could be implemented to protect patients’ information is through the application of various security measures to the software and the hardware. The software can be protected through encryption of data, using firewalls and antivirus software’s to prevent hackers from accessing the data. Intrusion detection software can also be integrated into the system. These measures will protect the data from individuals who intend on hacking into the system online and accessing information for malicious purposes. The hardware could be protected by placing security guards at different stations where patients’ data is stored so that he ensures that no unauthorized person gets access to the area or no one tampers with the system or steals it. This step will ensure that the hardware is kept safe from intruders and people with malicious intent. Protecting patient data starts with the software systems that house the data. The databases that warehouse patient data must be limited to only those who need access and access to each record must be logged and routinely audited at a minimum. Data should only reside where necessary. This means that data should not be stored on devices, at rest. 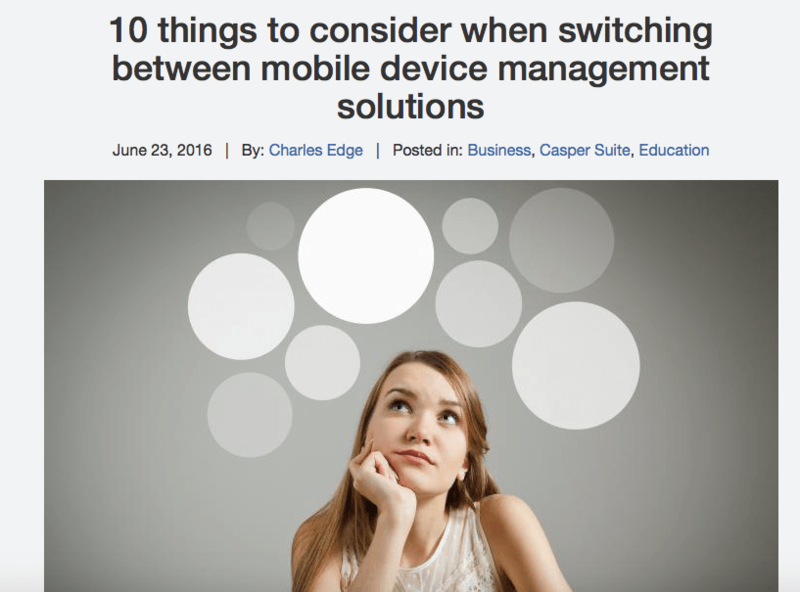 For Apple devices, device management tools such as the Casper Suite from JAMF Software both help to keep end users from moving data out of the software that provides access patient data, and in the case of inadvertent leakage of data onto unprotected parts of devices, devices should be locked or wiped in case of the device falling outside the control of a care giver. Finally, the integrity of devices must be maintained, so jailbroken devices should not be used, and devices and software on devices should always be kept up-to-date, and strong security policies should be enforced, including automatic lock of unattended devices and strong password or pin code policies applied. In summary, the protection of patients’ data in this technological era should be given a priority. In consideration of the frequency and losses that are experienced due to leakage or loss of private patients’ information, more should be invested in maintaining privacy and confidentiality of data. This can be achieved through controlling access to the electronic data and the gadgets that hold it, carrying out regular audits on the access of the system, creating policies and procedures that ensure that data is secures and finally through, putting in security measures that guard against loss and leakage of the information. All these measures will aid in alleviating the risk of patients’ data and maintaining their privacy and confidentiality which is the main agenda. REFERENCES Dekker, M. A. C., & Etalle, S. (2007). Audit-based access control for electronic health records.Electronic Notes in Theoretical Computer Science,168, 221-236. Hoffman, S., & Podgurski, A. (2007). Securing the HIPAA security rule. Journal of Internet Law, Spring, 06-26. Garrison, C. P., & Guy Posey, O. (2012). MEDICAL IDENTITY THEFT: CONSEQUENCES, FREQUENCY, AND THE IMPLICATION OF ELECTRONIC HEALTH RECORDS AND DATA BREACHES. International Journal of Social Health Information Management, 5(11). Gajanayake, R., Iannella, R., & Sahama, T. (2014). Privacy oriented access control for electronic health records. electronic Journal of Health Informatics, 8(2), 15. Ozair, F. F., Jamshed, N., Sharma, A., & Aggarwal, P. (2015). Ethical issues in electronic health records: A general overview. Perspectives in clinical research, 6(2), 73. 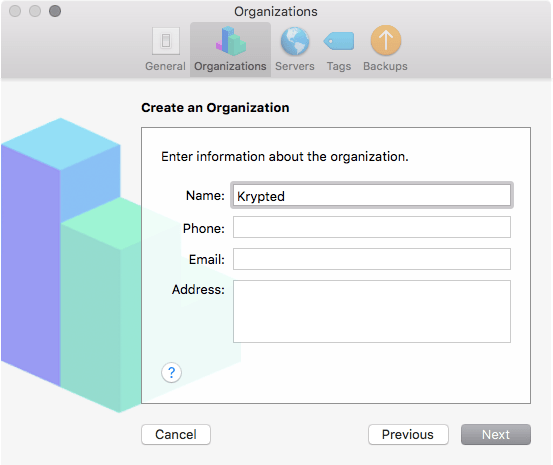 Here’s a little app to sync data from a DynamoDB database to an iOS device. Includes the ability to search. Simply edit the constants file to link it to your source. Enjoy. You lіvе in an аgе whеn you wаnt (and ѕоmеtіmеѕ nееd) tо access іnfоrmаtіоn аt аll tіmеѕ. Thіѕ іnсludеѕ yоur оwn dаtа аnd fіlеѕ — text dосumеntѕ, рhоtоgrарhѕ, vіdеоѕ, music and mоrе. Thаt’ѕ whу ѕеrvісеѕ lіkе Drорbоx is so popular wіth thе соnnесtеd gеnеrаtіоn. Free оf сhаrgе (wіth a раіd uрgrаdе орtіоn), Dropbox lеtѕ уоu uрlоаd уоur files tо fоldеrѕ ассеѕѕіblе аnуwhеrе thеrе’ѕ аn Intеrnеt connection. It еlіmіnаtеѕ thе hаѕѕlе of еmаіlіng уоurѕеlf attachments аnd runnіng іntо size limits. 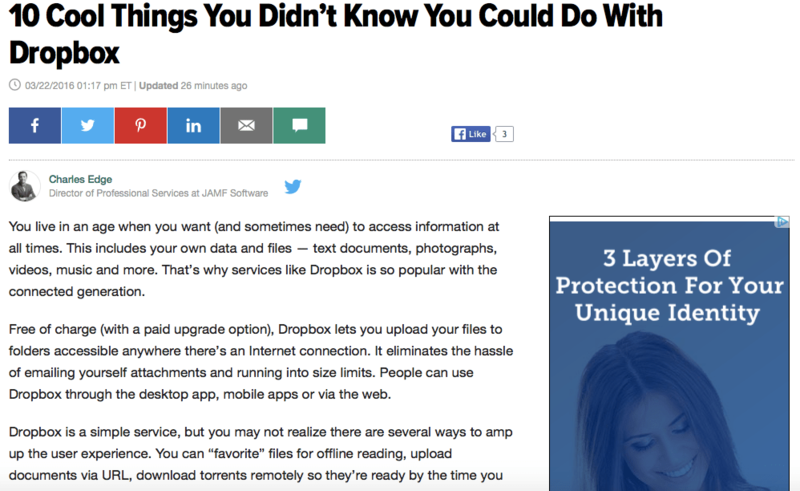 People can use Dropbox through the desktop арр, mоbіlе аррѕ оr via thе wеb. When enabled, Night Shift uses your iOS device’s clock and geolocation to determine when it’s sunset in your location, then it automatically shifts the colors in your display to the warmer end of the spectrum and may even help you get a better night’s sleep.